I’m late to your post but so thankful I finally found my way here! You’ve offered up such a rich selection this week. I always assumed squirrels were everywhere–if I even thought about it! They endlessly entertain me with their gymnastic antics and I can’t imagine the fun of watching them for the first time. We have audacious red ones and grey ones here, but I grew up with black ones. I no longer can easily visit zoos and the plight of those monkeys is heartbreaking. Your poem captures that sad resignation. The tree photo is awesome! I love hearing about your Hanoi adventures! Thanks Molly. The ones here are black with red tails and the males have bright red stomachs. Who knew that Hanoi had squirrels! Wow. Thank you for this visit to Hanoi and your poetry. Would love to visit myself. It really is a beautiful and interesting place. I do enjoy watching the squirrels’ antics, though many people around here complain about them because they are infamous for raiding bird feeders. Those poor monkeys. It does feel like it’s hard to make a difference, but change does come even if slowly. Your poem reminds me of Ivan. Thanks Kay. We can’t change the whole world, but we can change bits – and hope that other people do bits too. Lots of small differences. I remember visiting a zoo in Japan that was so terrible I left in tears – animals pacing endlessly in small, cramped cages, with dirt floors and metal bars, a lion banging its head against a glass wall as families watched and pointed at it. I have been to wonderful zoos that pay a lot of attention to the care and well-being of their animals, and as you say they can be great educational tools, but when a zoo is poorly run, it really is heartbreaking! And as for squirrels – they are everywhere here, and very bold and cheeky! Thanks Jane.I have been warned against visiting the Hanoi zoo, and won’t. Just the monkeys and peacocks was sad enough for me. Good to hear about more Hanoi adventures. I was as tickled pink as you were seeing squirrels for the first time, since Hawaii doesn’t have them either. Sad about the monkeys, and I emphathize with your feelings about caged animals and zoos. Nature’s resilience is indeed amazing. Thanks for the poems and pics! Thanks Jama. Nature is indeed amazing. Sally, squirrels have been a great topic of discussion here in New England. It seems that last year there was an abundant acorn crop, which resulted in an abundance of squirrel babies. Now this year, with a normal crop, and too many squirrels, there in an abundance of crazy squirrels crossing the roads to forage. I needn’t tell you the results of squirrels meeting vehicles. Your trip sounds wonderful–lucky you! Thanks Diane. Sad to think of squirrel v vehicle. In Australia we have similar issues with kangaroos – but of course being much bigger it doesn’t end well for the car OR the kangaroo. No squirrels in Australia! Who knew? (Not me, clearly.) How nice of that one to pose for you! Those monkeys (and other caged animals) will weigh on my heart. The work we must do to make our world just is endless. I like that you ended with that powerful tree, and its reminder that we humans are actually fairly insignificant in the big scheme of things! Thanks Mary Lee. No, no squirrels – except on zoos. Sigh. And yes, we really are insignificant – and yet responsible for so much that has been done to our world. 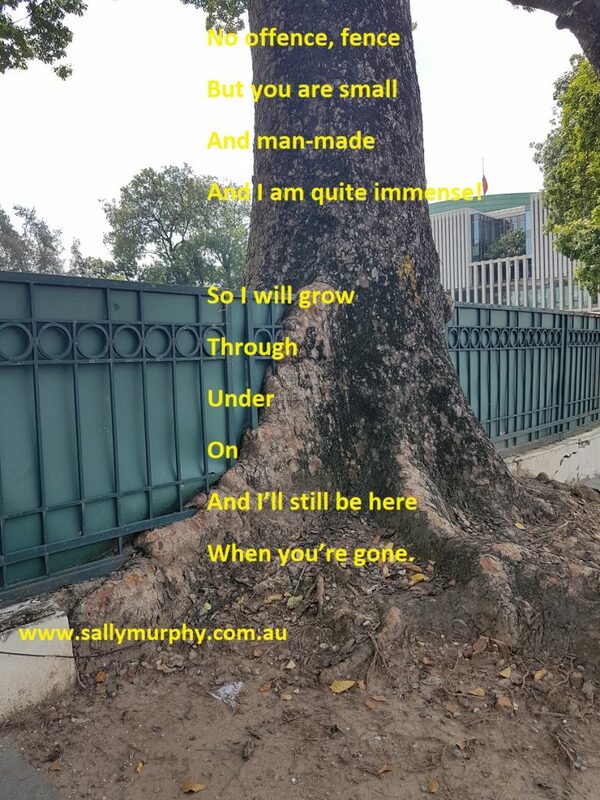 Sally, thank you for your varied poems. The monkey one is sad, the majestic tree amazing, and the squirrel scampers through life freely. We have squirrels all throughout our neighborhood and old trees with massive roots but I never saw one that passes right on by a fence. I wanted you to know that I saw many geckos in Flordia last week. I was amazed by their miniature size. One had a curly tail but none of them let me take their photo. Thanks Carol. No I have never seen a tree do what these trees did. Amazing. Glad you caught up with some geckos. They are not too keen on having their photos taken – I am lucky that they are attracted to my living room light – they hunt bugs on the glass wall all evening. Poor monkeys! Thanks for sharing your thoughts and experiences with us, Sally. Changes will come. 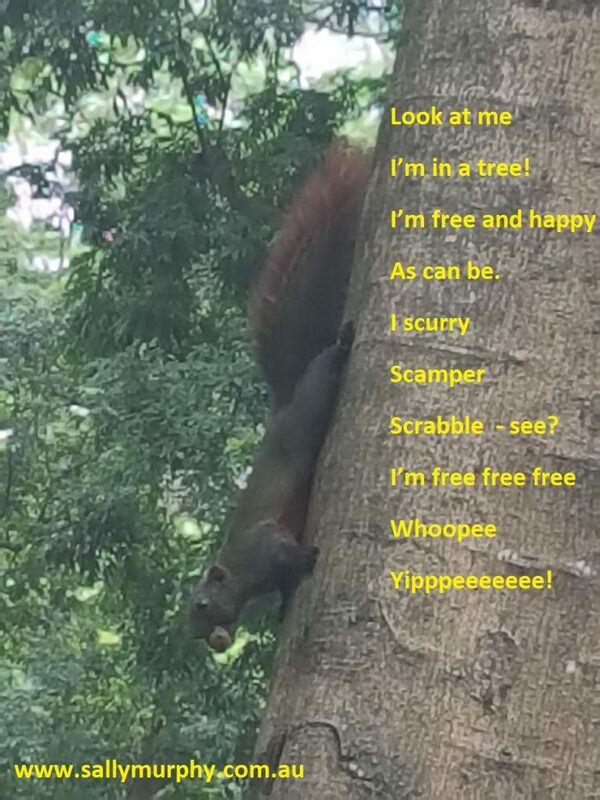 I will have to share you squirrel poem with my daughter. When we moved back to Florida, she was amazed at all the squirrels (Utah, where we moved from, doesn’t really have many) and it quickly became her favorite animal. I hope she likes it, Rebecca! Yes, I understand about the cages & the zoos that educate, and we have a zoo that appears to be changing habitats for the animals to be more like the real world as fast as they can. And we have squirrels here, too, everywhere! I had to capture one in my house once, not fun. I love that you wrote a variety of looks at the animals you’re discovering, happy or sad. Squirrel in the house? that reminds me of a favourite picture book we had when my kids were younger, called ‘Possum in the House’. So much fun – and chaos. But yes, I can imagine catching a squirrel would not be fun. But outside, where they belong, they are fascinating, especially to someone who doesn’t see them often. Thanks Irene. I was struck by this tiny changes thing when I attended World cleanup Day her. Vietnam has a huge issue with rubbish (trash), and as i worked alongside locals and people from around the world, a man said to me “But it will probably be like this again in a month’s time’. And while I hoped that wasn’t true, I knew it probably was. But then I realised that the tons we removed that day were being removed from the cycle. And that those working there and those witnessing what we were doing would all be moved to make little changes. And that it’s those little changes that gradually add up to a big change. 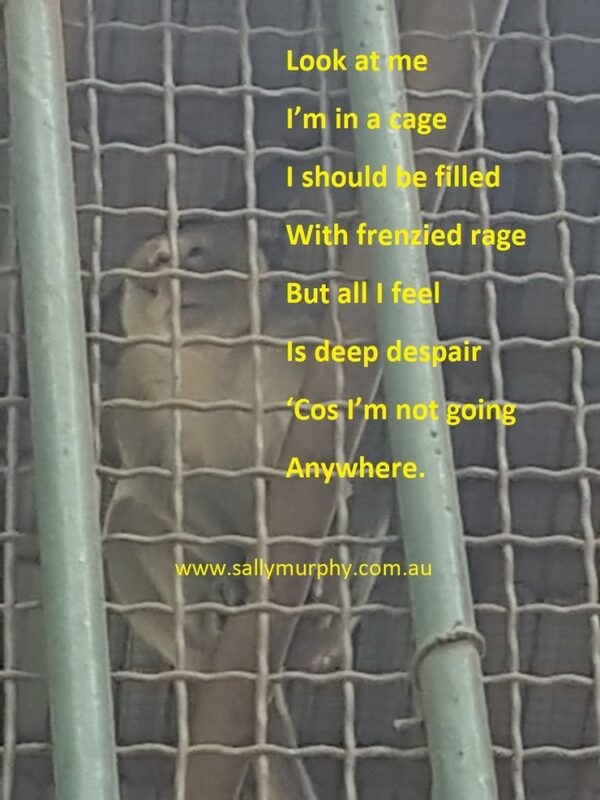 Three wonderful poems Sally–even the melancholic monkey poem. I have a hard time with zoos and animals put in smaller habitats than they ought to be also. 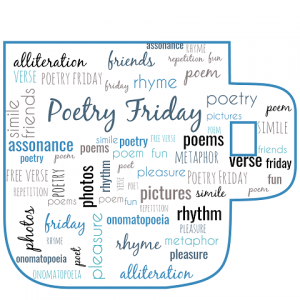 Squirrels are so much fun to watch–And Yay for your boisterous tree poem, thanks! Thanks Michelle. i think we must write about the difficult stuff sometimes. I tried to write a poem where the squirrel and monkey talked but found that just didn’t work because I couldn’t find the resolution.